Heather and James met when they were in high school. They dated for 2 years, and Heather describes him as her first true love, but when James went into the military and Heather went to college, they decided to break up. Over the years, they kept in touch, until 2015 (TEN years after they dated in high school!) when they decided to hang out one night. After that, the rest was history. They rekindled their love, and here we all are, preparing for their wedding day! 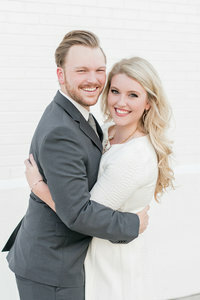 Their engagement session is one for the books. Their model skills, that light, their outfits… it was a perfect storm to create one of our favorite sessions! And if their engagement session was this good, we can’t imagine what the wedding day will be like! Heather and James are tying the knot at The Cathedral of Saint Paul and then celebrating their marriage at The Florentine in downtown Birmingham. We can’t wait!